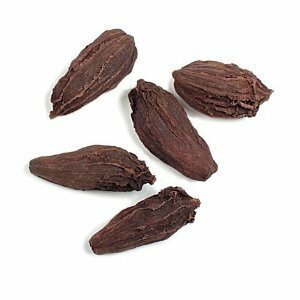 Black cardamom (Amomum subulatum) is also known by the names Nepal cardamom, Greater Indian cardamom, and brown cardamom. It is a member of the Zingiberaceae, or ginger, family. The Amomum subulatum species is native to the eastern Himalaya region, and production centers in Nepal and Sikkim. Other species of black cardamom (Aframomum, for example) grow in southern China, Somalia, Madagascar, and Camaroon. Black cardarmom has a flavor that is more intense than the smaller, green cardamom. The latter has a smoky taste, redolent of pine and camphor with an astringent effect. The 3-centimeter pods of the black cardamom may be used whole as a flavoring in stews made of meats. If used whole, the pods should be removed prior to serving. The seeds may be used crushed or ground. Ideally, store in a tightly sealed container, away from light and heat. Grind seeds right before using, for maximum flavor. Black cardamom is used as a primary component in the ubiquitous Indian spice blend garam masala, along with coriander seeds, black pepper,cloves, and cinnamon. It pairs well with other "heating spices," and is excellent in rice dishes and curries containing either meat or vegetables. If you have any questions about this product by Swad, contact us by completing and submitting the form below. If you are looking for a specif part number, please include it with your message.